Will the Xbox 2 Ditch Split-Screen Multiplayer? There was something so real, so authentic about playing in the same room as your allies or adversaries based on the situation. What if I told you that it was going away? Would you care? Would it affect the games you buy and the ones you play, or are you already fully committed to a world where you play with tons of other people, but in reality your completely alone? It sounds ridiculous, but if you grew up playing split-screen and then online, you know exactly what I'm talking about. Will this feature still exist on Xbox 2? Perhaps, but it may take on another form. Join me as we look at the facts and the uncertain future. Depending on when you were born, online gaming was probably still in its infant stages, and only available widely on the PC. When I was growing up I had a dial-up connection and if I was lucky I got to play Everquest online. The only other form of multiplayer I knew was sitting in the same room with a bunch of friends Sometimes we fought each other, sometimes we race,d and sometimes we played co-op and worked together. Sure, screen-peeking was a mortal sin, but otherwise we got along just fine. My brothers were all about sports and outside activities and I was the one who liked games. Back then it wasn't considered "cool" to be a nerd so they like to gang up on me. The only time we ever bonded was over a game. Even if I stooped to their level and played a WWE game with them, it was nice to just be accepted. As they grew up and matured, my brothers both eventually got game consoles of their own and now I'm the wise sage they come to for gaming advice. It's funny how the times have changed. Were it not for those late nights of WWE wrestling matches or intense football games in Blitz, would they have ever ended up being gamers? I shudder to think about it, because as they are now, I couldn't be more proud. They've had their hardships, just like anyone else, but when they started playing games,we connected as brothers more than we ever have. Without that mutual bond, I don't know that we would have ever found common ground with which to finally sit in the same room with each other and not mull over old wounds or participate in awkward small talk. Gaming gave them focus, it gave them a release from the stress of life, and best of all, it gave us something to finally talk about besides the past. All of that can be tied back to the experiences we had playing together, in the same room, when we were kids. You know, one of the games we did play a lot (my dad included) was Halo. Now, I have to be honest, my dad only played Halo once and he managed to face palm a Banshee before giving up and deciding to watch, but it was still a memory I hold dear as a gamer. Every Halo game since the first one has had split-screen multiplayer and a co-op mode to play offline with two players. Halo 5 came out on Xbox One, and suddenly that feature was gone. My whole world felt like it had been turned upside-down. 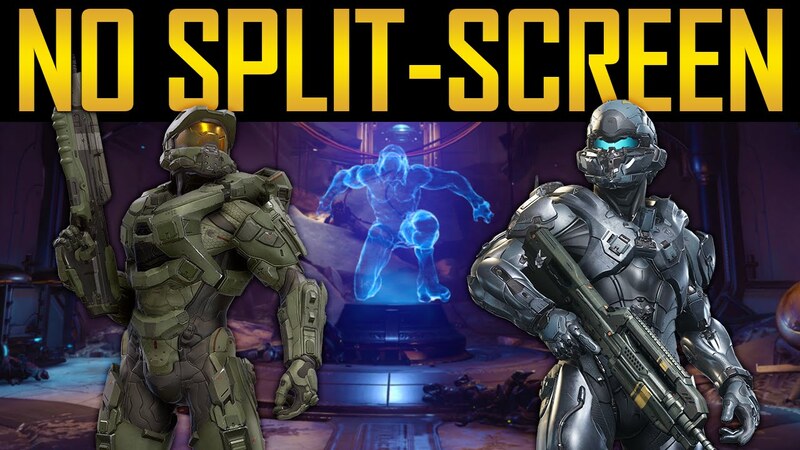 While Halo 5's lack of split screen was certainly a shock and a tragedy to say the least, this isn't the first time I've seen games ditch this feature in favor of better graphics, higher frame rates, and more online features. They've even gone so far as to start releasing games without a campaign at all, but that's a rant for another time. I played through Halo 5 and I really didn't like it. Yes, that was due in most part to the bland story and boring gameplay, but it also fellow hollow without my significant other sitting beside me with a controller in hand. Sure, she sat and watched, but we had hundreds of times more fun playing Halo 1-4 on the Xbox One Master Chief collection. They left out the split-screen option because they said they wanted to keep the gameplay at 60 frames per second. They say this, and then Call of Duty: Black Ops III releases with split-screen across all of their modes. This does bring up another point of contrition though: the tiny screen effect. Ideally, a game with split-screen multiplayer takes the full picture and divides it evenly. Since the Xbox 360 though, we've seen games that provide you with two smaller screens to play on and fill in the space with a mini-map or just blackness. It makes it difficult to see anything, even on my 60-inch TV. Again, this is most likely the result of hardware constraints, but I would sacrifice frame rate any day of the week for a normal and functional split-screen co-op or multiplayer. Is There Any Hope For Xbox 2 Split-Screen Multiplayer? There are two silver linings to this dark cloud of separate-but-online gaming that we've fallen into. I don't have anything against it, but I find it ironic that the only way we as gamers can play with each other these days, is to be apart. How does that make any sense from a social standpoint? Where mainstream publishers are ditching the old ways, indie titles have been coming out with split-screen options. This could point to a future where at least these independent studios keep the tradition alive. The other option comes from a newly announced feature that the HoloLens may have. A developer working with the device recently showcased a video where they took the image on a television screen and projected it into the real world through the augmented reality device. Essentially one person could play on the Television, while another could play with their HoloLens, possibly streaming form their own console or the cloud, and see their own screen. You still get to play together in proximity, and you even get your own screen. It's a long shot, but it's something that I'm hoping will come to fruition. I grew up playing games,and split-screen multiplayer has helped me forge bonds with people through a common hobby. I don't want to lose that feature on Xbox 2, but I fear there's not much I can do about it. I know there are those who agree with me, so leave a comment and share your thoughts. Together we can keep this integral part of gaming alive. I don't know really I have always had my own xbox and my brothers have always had their own console, but I have had a little split screen when I was as young as 5 and to be honest it was good. Me and my dad play forza games on xbox 360 and it's very rarely he plays. He only plays when he is playing with me. I m 17 now and I never play with anyone any more so it wouldn't really matter to me now. Because I just want time alone.